Till October 1 scientific, cultural, tourism and business communities can nominate candidates for Lviv Honorary Ambassador’s title who with their authority and expertise contribute to the promotion of the city in their professional business circles. 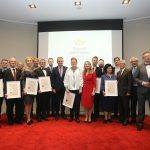 This year Lviv elects its Honorary Ambassadors for the fourth time. Which is important in the development of the meetings industry of the city. «Honorary Ambassadors are inviting business events (conferences, forums, AGMs, exhibitions, symposiums, summits etc.) to Lviv. Ambassador’s authority helps our city, because when looking for the destination of a business event, organizers also consider who’s inviting them. Who can become Lviv Honorary Ambassador? To be eligible to apply for the Program, the candidate needs to have a tight and long connection to Lviv, success in business, respect in the professional field with a good reputation, and personal participation in the conference management, be a public figure with high level of morality. The submission of applications lasts from 3 July till 1 October 2018. Candidates for Lviv Honorary Ambassador can be nominated by universities, tourism organizations, associations, NGOs and unions, leaders in the fields of science, politics, business, IT and culture, local governments. To nominate a person for Lviv Honorary Ambassador, one needs to complete the application form and add two letters of references. The special commission examines applications and selects no more than 12 finalists. Gala of new Honorary Ambassadors will take place in November. Lviv Honorary Ambassador’s title is given for two years.